Is there a better alternative to Templates for Business Letter? 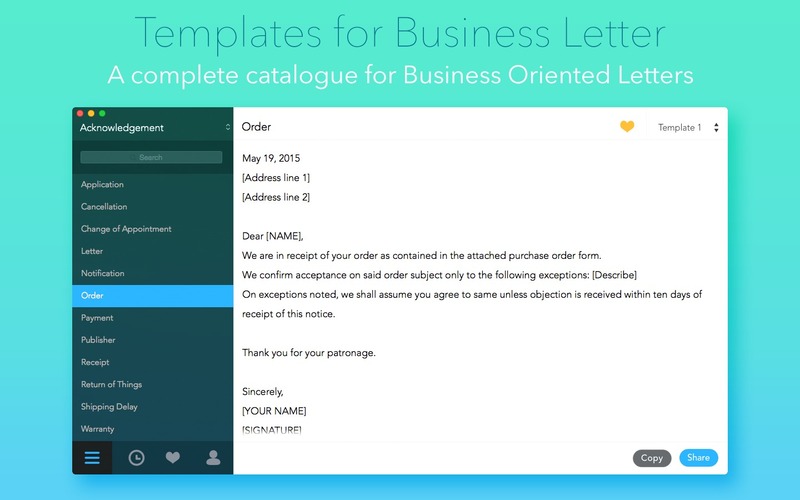 Is Templates for Business Letter really the best app in Inventory category? Will Templates for Business Letter work good on macOS 10.13.4? Templates for Business Letter is a vast directory of premium sample letters, ready to use for business purposes. This app will help you in drafting letters in a highly professional format and fetch you excellent results. It consists of a variety of pre-written sample letters, covering all sorts of categories. You will find your choice very easily from this vast catalogue of letters and you will be able to draft letters of any kind very quickly and forward them for quick results. It would definitely turn out to be a very useful app to have in your Mac. Templates for Business Letter needs a review. Be the first to review this app and get the discussion started! Templates for Business Letter needs a rating. Be the first to rate this app and get the discussion started! Add user info like Name, Sign and Address in Preference window. Mark sample letters as Favorite that you use frequently and find them quickly in one place. The app interface is fully editable and you can edit letter according to your needs and save them for using in future. Disclaimer: The letters and contents of this app are designed for reference purpose only and do not convey any form of business guidance or development. The publisher of this app will not be responsible for any loss or damage arising directly or indirectly from the use of this app.